If you’re a curious traveler or resident of Indiana, you’ll be pleased to know there are plenty of strange sites to explore. From the largest ball of paint in the world to areas that defy gravity, there’s a lot to be discovered. Here are the 15 most unusual attractions in the state. The courthouse in Greensburg in the southeast central portion of the state is a little strange. The building itself is growing a tree. A few random tree seeds fell into the cracks on the roof near one of the corners, and took root. A tiny forest began on top of the building, but now only one tree remains. Too bad it wasn't a fruit tree so the judges could have a between-hearing snack. 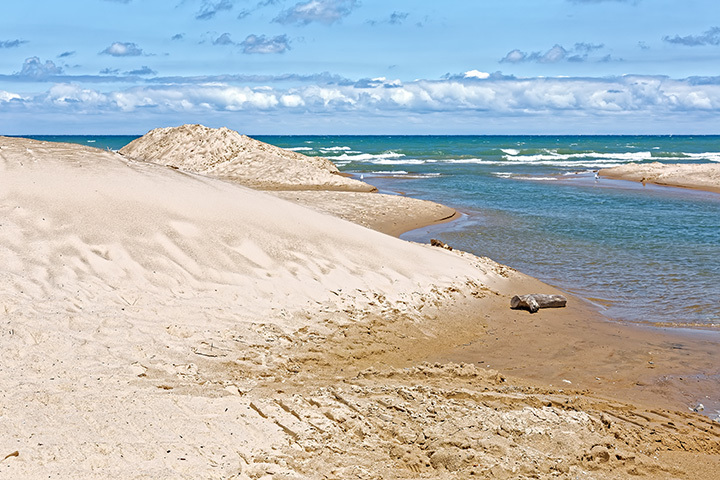 North of I-94 sits a geologic phenomenon known as dunes. Dunes are mobile landforms composed usually of sand in one form or another that migrate either quickly or imperceptibly. In the extreme north of Indiana, there is a whole park dedicated to the exploration and admiration of the Indiana Dunes including trails and opportunities for geologic study, with an opportunity to participate in a geocaching adventure (an activity recognized by the DNR!) with other tourists. The Ice Age didn't wipe out all of Indiana … the southern part of the state looks a little like Swiss cheese. Some of the more toured caves are Squire Boone Caverns, Wyandotte Cave, a historically landmarked Twin Caves. Plus, a new “show cave” has been opened for tourism just outside Corydon. It's part of the Binkley System and is ranked seventh longest cave in the nation, and longest in the state. Welcome to Indiana Caverns! Yes, you read that correctly. Over 25,000 layers of paint coat what was once a regulation-sized baseball. Want to be part of the record-setting attraction? Make an appointment and paint the ball yourself, just as celebrities and other people from around the world have done. Pics or it didn't happen? Nah, the owners will give you a certificate! The Big Boy statue of a baby-faced waiter in a paper boat hat serving up a burger on the double is easily recognizable as a burger-joint hallmark, but it didn't originally belong to the Frisch's restaurant franchise. The Frisch's Big Boy is actually less common than its counterparts belonging to other chains, and there is one right at the crossroads of Broadway and East Grand. The Big Boy of Anderson likes to bring a smile to passers-by when he dons a painted Indianapolis Colts jersey belonging to the current quarterback. This is one rotary club you did not want to be part of! The first ever rotary jail built, and the last operational, still turns about in Crawfordsville. The idea was for there to be only one exit at a time, making jailbreaks a thing of the past. Did it work? Must not have, because only 18 rotary jails were ever built in America and only three survived, and only one in working condition. Thankfully, it's no longer an incarceration facility, but a museum with events, classes, and tours at certain times. In Evansville, near the southern tip of the state, the graves of Isaac Harrison and his wife Elizabeth lie side by side in Oakhill Cemetery. Why are these people special? They are the confirmed, double-checked, thoroughly vetted, verified-certified, true and original Gypsy king and queen. During the time when the Romany people still existed in nomadic groups of a more Bohemian nature and their group leaders were still known as kings and queens, Isaac and Elizabeth Harrison were one such pair of leaders. Their group had emigrated from England to the States in the mid-1800s, and since Isaac owned a section of land in Evansville, Indiana, and even lived in a stately Victorian in town, his wife and then he was buried in the nearby cemetery. Another man of the same heritage was buried in Oakhill, setting up something of an unintentional tradition for Oakhill Cemetery to be a Gypsy and Romany burial ground. The new generations reside in the southern United States (and according to multiple rants and blogs, detest being called Gypsy anymore for reasons not very clearly stated nor entirely agreed upon). In the little hamlet of New Harmony, Indiana, a slab of rock sports a set of footprints purported to be those of Archangel Gabriel with a special, secret message for early-1800s commune prophet George Rapp, supposedly including the world's end-date as Sept. 15, 1829 (Spoiler alert! It didn't happen). George and his scattered followers are gone, but the slab remains, in however terrible a condition thanks to the snobbish treatment of it by its owners who, according to Connie Weinzapfel, director of Historic New Harmony, refuse to even install a cheap Plexiglas box over it. That's why, if you ever try to have an up-close and personal encounter with the barefoot prints, you won't be very successful. If you just wish to see them, you can look through a grate in a brick wall bordering the property, or just over the wall itself if you're really bold. It's more of a “just so you know it's there” thing. Geologists, physicists, and other scientists have studied the slab and its history, and they're all stumped. Angelic impressions? Fossilized remains of pre-Flood people? Layover spot for the connecting flight to Roswell? A hoax altogether? Who knows, but the only thing we know the prints are is unexplained. You can't miss it! What was once a rusty old grain silo is now a stories-tall Minion! The Stark family made the transformation as a smile-tugging uplift to the scenery and a from-the-road-please picture opportunity for passers-by. The giant yellow character sports the family's initial S instead of the evil supervillain's G, but it is no less adorable. Do you have a strong stomach, a sense of adventure, and a morbid curiosity? LaPorte has a rather sizable display of recreated Medieval-and-later torture and execution devices. Don't worry, he doesn't do anything with them except display them and let people come by and learn about how dark and evil human beings can be, so that hopefully we never repeat those periods of history. None of these are actual historical artifacts: Each piece is painstakingly recreated from nothing but historical descriptions and pictures from Google. It's rather a macabre hobby, but to each his own. May we all learn from it. While its name sounds more like a mixed drink rather than a restaurant and inn, the Slippery Noodle holds a secret in its walls … literally. One brick wall of the building is riddled with pockmarks and bullet holes, some of them still embedded with the slugs. A shoot-out? A bar fight gone deadly? No, just target practice … by John Dillinger and the Brady Gang. The staff will gladly show you, if the room isn't already open. Hidden within the woods in Cannelton is the world's largest Celtic Cross carved from a single rock. A 20-foot-high boulder was first partially hollowed and then chipped at until a Celtic Cross stood under the arch of its own mother-stone. It looks like a relic of the enchanted past of the Emerald Isle, but it was carved over two years just within the 21st century. Feel a special kinship with wolves that goes beyond human understanding? For a fee, you can purchase a year's access to go in and get kissed by friendly wolves. Your money is actually going for sponsorship of a wolf in the wildlife park, so consider the wolf kisses as thanks for your generous support. Attend seminars and other educational events, even get your kids involved in the mission of Wolf Park. Parked outside the local Veterans of Foreign Wars post in Mishawaka (northern part of the state), there is a heavy artillery cannon known as the howitzer. This particular machine saw combat in Vietnam, Korea, and World War II. Known as Big George for the name painted on its side, the cannon stands as a monument to the foreign wars it saw and for the men who fired it. Just when you thought Indiana couldn't impress you any more, she comes up with one more unusual attraction for you. Gravity Hill. If you've ever been to The Cosmos in South Dakota, you'll understand what a strange thing this is to experience. Find Gravity Hill (not clearly marked but general directions on the website will help you get there), put your car in neutral, and it's all uphill from there. No kidding, your car begins to roll uphill. Put on your hazard flashers, just in case.